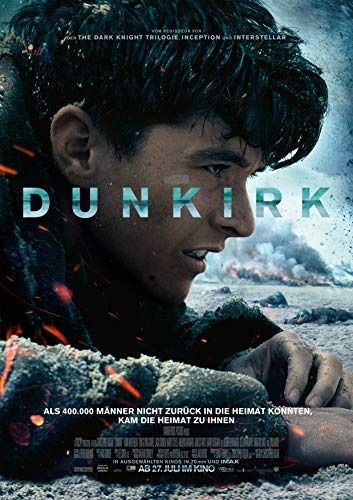 In 1940, during the fall of France, hundreds of thousands of Allied soldiers have retreated to Dunkirk. Tommy, a young British private, is the sole survivor of a German ambush. At the beach, he finds thousands of troops awaiting evacuation and meets Gibson, who is burying a body. After a German dive-bomber attack, they find a wounded man. They rush his stretcher onto a hospital ship, but are denied passage themselves. The ship is sunk by dive-bombers; Tommy saves Alex, another soldier. They leave at night on a destroyer, which is sunk by a torpedo from a U-Boat. Gibson saves Tommy and Alex, and they are brought ashore by a rowing boat. Read more on Wikipedia.